Get rich easily - No purchase required - All you have to do is give out FREE fax numbers! To start this venture, your start-up fee is: NOTHING! Zero Rand - R0.00! Receive advertising on Google worth R600 - for free! You will receive a functional website page - free! Now you sit back and earn commission on every fax that THEY receive! Make money! Please complete this form with your details so that we can activate your account. *optional. It is free here! Telkom shares the profits from their 086 fax service with the distribution channel (including you). You promote the service by giving out free fax numbers - the recipient does not pay anything - the service is free. You will receive your own personal link and a single website page that you use to sign people up. 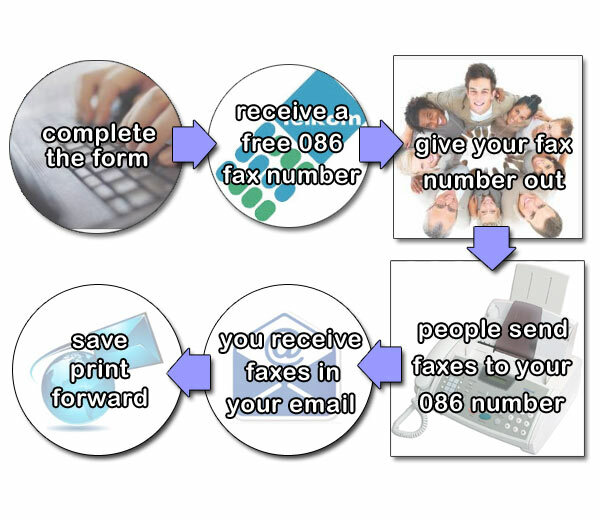 Individuals and business can request their own free fax number from your page - through your link. The process is automatic, they get their number immediately, you don't have to do anything. You can, for example, assign a fax number to everyone in your office or company, and get paid for the faxes that they receive. You may use the link as a footer in your emails, or you can iframe the page in your own website. That's all you need to do - you then get paid when they receive faxes! Payment is based on the total number of fax minutes that an agents' clients receives. We will send you a statement and will pay on invoice. You must be 18 years or older! If you are younger than 18 years of age, you may get your parents to apply on your behalf! Becoming a free fax to email sales agent is easy and no sign-up fees are required. No targets apply. This is a profit-sharing arrangement, in other words, you get a percentage of the profit that we generate. Even though there is no contract between us and the sales person, there are terms that change from time to time, and in all cases: we have a strict no-spam policy. You may not spam any individual or company by any means, including but not limited to phone calls, mail, email or SMS. Spam means an immediate ban and loss of all income, pending and future. How do I sign people or companies up? We will issue you with your own unique link that you can use. You will also receive your very own signup page where people can enter their details. You may use this link and signup page in your emails and websites. The commission earned by you is a profit-sharing arrangement. We will pay you for the faxes that your clients (your "sign ups") receive. The amount earned is based on the number of minutes that the faxes take to be received. For example, a client received 100 minutes of faxes, you will get paid for 100 minutes x "the rate / minute". "The rate / minute" will be sent to you once you have been activated on our system. For an example of an invoice, please see our "how to create a valid tax invoice" page on our site. The income is a recurring, and it is not a once-off payment, this means that the distribution channel continues to earn income indefinitely, as long as your clients continue to receive faxes, and as long as the entire distribution channel is active. It is important to note that Telkom and the main distributor sets the terms and conditions of this arrangement, and that this is subject to change at any time. Please note that the minimum payout is R500. Once you have generated a minimum of R500, we will send you a report and we will request an invoice from you with the amount. Please include your bank details so that we may make payment. If you request payment below this amount, we will deduct an admin fee of R50 per transfer. No fees are payable above R500. There is no maximum limit or cap to the income that a sales agent is able to earn, in fact, the more you earn, the higher your rate / minute! Terms and conditions do apply with regards to a strict no spam policy. No minimum number of sign-ups are required. A website is not required but it is highly recommended. For the maximum benefit, advertising will be required. The taxes are the agent's responsibility and the income earned must be declared to SARS in your financial year end if you are a business, or at the end of February if you are an individual. We have a record of your invoices and we are legally obliged to send these to SARS at their request. If you are unsure, please consult a professional accountant, but we can confirm that your obligation is that you must declare this income to SARS and that you must pay taxes on this income to SARS. You do not have to be a registered business to earn commission, you can be an individual and you will pay taxes in your personal capacity, as you do with rental income and salaries. If you incur expenses, you can claim these expenses if you keep records of the expenses, such as invoices. Valid expenses include advertising, travel (a log book is required), business cards, domain hosting, Internet access and cell phone calls (with itimised billing records as proof). The fax-to-email business follows a defined profit share process, and as far as we are aware, it is in line with Shar'iah Law. What do my clients get? Your client gets a free fax 086 number to use. Your clients receive faxes on this number, and the faxes are sent to their email, it is that easy. More details may be found below.